Jim Wade is the owner of UNITY Financial Services in Mesquite, Texas. UNITY Financial is dedicated to building a trusting relationship with individuals and small businesses for the purpose of achieving their financial goals. Founded in 1977, UNITY Financial provides wealth management, tax compliance, estate planning and business consulting services to a diversified and growing client base. Jim is a Certified Financial Planner™ (CFP®), Certified Senior Advisor™ (CSA®), Certified Estate Planner™ (CEP®), Certified Fund Specialist (CFS) and an Accredited Tax Preparer (ATP). He is also an investment company representative*, general securities representative*, registered investment advisor agent*, life insurance agent (TX and OK) and variable contracts agent (TX and OK). He is licensed to provide investment services in the states of Texas, California, Missouri, New Mexico, Oklahoma, and Washington. 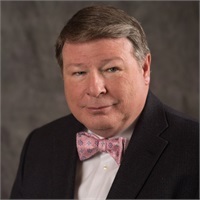 He is a member of the Financial Planning Association, the National Society of Tax Professionals, the American Academy of Certified Estate Planners and the Society of Certified Senior Advisors. Jim holds a BBA in Accounting from East Texas State University and an MBA in Finance from Southern Methodist University. Jim has accounting, tax and financial analysis experience at three major oil corporations and was a program planning consultant on the Superconducting SuperCollider. Jim received the 2014 Five Star Wealth Manager award and was recognized by The Mesquite News as its 2012 Readers’ Choice Best Financial Planner and 2013 Readers’ Choice Best Financial Services provider. Jim lives in Sunnyvale and is currently (again) a Town Council member. He previously served six years as Mayor of the Town of Sunnyvale and three years as a Trustee of the Sunnyvale Independent School District. Jim served fifteen years as a Director and Vice President of the Sunnyvale 4A Development Corporation and twelve years as a Director of the Sunnyvale 4B Development Corporation. He has also served on the Planning and Zoning Commission and the Board of Adjustment. Jim is a member of the Mesquite Chamber of Commerce, the Sunnyvale Chamber of Commerce and a member and Past President of the Mesquite Rotary Club. He currently serves as Treasurer and Past President of the Mesquite Symphony Orchestra Association. He is the Founding Director and current President of the Hope Charitable Foundation and a Founding Director and current President of the non-profit Friends of the Sunnyvale Public Library. He and his wife, Kay (an educational diagnostician for Dallas ISD, now retired), are members of First Baptist Church in Dallas where Jim serves as a Deacon and is a Past President of the Sanctuary Orchestra and a Past Chairman of the Finance Committee. He is a Past Chairman of the First Baptist Academy Board of Trustees and currently Chairman of its Finance Committee. Jim plays trumpet in the FBD Sanctuary Orchestra and the Dallas Praise Orchestra and, as a musician, has traveled to Zambia, Kenya, Argentina, Brazil, Israel, Russia, Australia/New Zealand and Scotland. Jim is an Eagle Scout and Master Mason. Jim and Kay have 2 children and 6 grandchildren.